Learn how to discover and correct behavioral problems to drive predictable growth with this guide to sales pipeline inspection. FunnelCake has evaluated common process issues in opportunity management across hundreds of Salesforce implementations in B2B organizations. This guide highlights common data points that can be used for coaching. By identifying and acting on red flags early, organizations have seen as much as a 2x improvement in lead-to-revenue conversion rates, with more reps consistently hitting quota. Sales managers need to drive predictable growth with visibility into sales pipeline and change rep behavior with coaching. This guide highlights how you can use common process issues and red flags in CRM data to create coaching moments with your team. A key way to achieve this is through sales pipeline inspection and coaching. Many sales management teams are solely focused on managing specific deals in the short-term forecast. While this can be effective, it creates a top-down, siloed approach that doesn’t develop your sales team. Forecast-centric coaching can lead to large gaps in your sales teams skill-set – by optimizing resources for the needs of management over the needs of the sales reps. This top-down approach can be effective, but leads to large gaps in reporting, disconnected processes, and a lack of development of the sales reps core skillset. This leads to sales pipeline meetings focused on dirty data and confusing processes instead of what’s required to win the deal. After analyzing hundreds of sales funnels, we’ve designed a holistic sales management model that supplements existing coaching methods with actions that enable reps to change rep behavior. This holistic model connects your CRM, processes, and targets directly to risk analysis and actions – enabling your sales reps to take direct action on your processes without the need for sales management intervention. This guide focuses on how processes and risk analysis in the opportunity funnel can drive coaching moments that reduce risk and increase the consistent performance of your sales team. Managing risk in open sales pipeline can be complicated for both reps and managers. It’s easy to stay focused on the marquee deals, while other deals to fall through the cracks. Red flag pipeline inspection is a fast, effective way to stay on top of every deal by mitigating risks every day. The following section highlights red flags you can use to identify risk, coach reps, and enforce best practices. Opportunity age is a highly predictive indicator of whether a deal will be won or lost. The amount of time an opportunity has spent in the current stage of the funnel. This can be compared to recent wins and historical trends for that stage. The total age of an opportunity since it was created. This should be compared to your historical sales cycle length. Age and activity metrics (covered next) work very well together to identify risks in your funnel. Is the opportunity still active? Why is this opportunity stuck? What can we do to move the prospect forward in the funnel? Do our sales reps use the stages of our funnel in the same way? Do we have clear criteria for when opportunities should enter and exit a stage, or be marked as lost? Should we implement automation rules to close-out stagnant opportunities? Activities, touchpoints, and tasks: logging these gives full transparency into what’s happened with an opportunity and what’s happening next. Logging interactions with an account are critical for documenting what’s happened and when – both for reporting, but also for hand-offs between teams and postmortem analysis. By the time an opportunity has made it to sales pipeline you’ve spent substantial resources generating and qualifying a lead – to have it die on the vine is a huge waste. If the opportunity is actually dead, but the rep hasn’t closed it yet, it’s falsely inflating your sales pipeline and impacting the ability for you and the team to have an accurate forecast. This also kills your ability to nurture these opportunities since most marketing automation platforms are set up to ignore contacts involved in open sales pipeline. 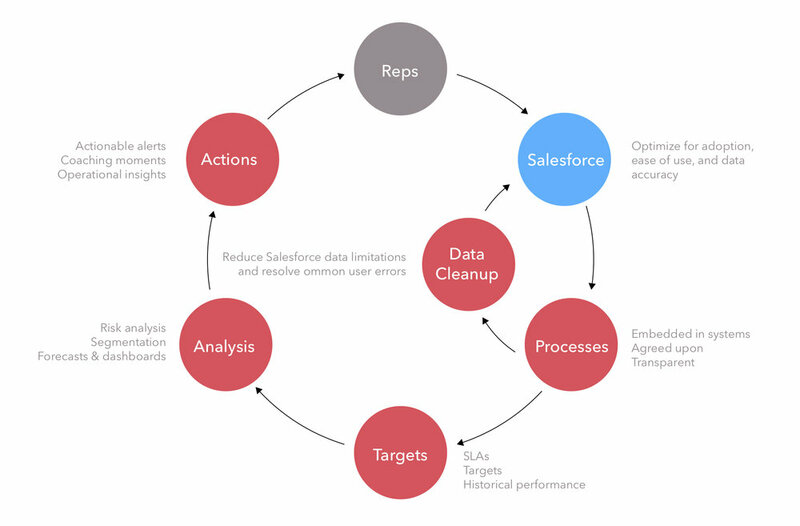 If the opportunity isn’t forgotten about and the rep is just neglecting to update Salesforce with progress, you’re losing out on insights about which activities, or how many activities it takes to move accounts through each stage of your funnel. You also lose the ability to have historical context if a rep leaves the organization or opportunities are handed off to a different rep.
Is this opportunity still moving forward? If yes: why is there no touch points on the account? If no: why isn’t it marked as closed/lost? Have you been in contact with this account? If yes: why aren’t you logging the information in Salesforce? If no: why has there been no contact in 30+ days? Do our reps have a consistent understanding of how they are supposed to log notes? Most reps give up on accounts too soon – touchpoints over time ensures reps work deals to their full potential. The main concern is letting qualified opportunities die on the vine – these leads were likely time consuming and expensive to generate through Marketing and Sales Development efforts. This can lead to long-term negative impressions about your business, such as prospects inferring a sales rep’s poor response times and lack of follow-up are how the business operates in all areas. Is this opportunity still active? Why haven’t you been engaging with them? What steps can you take to re-engage them? Effectively managing tasks in Salesforce helps reps to stay on top of their follow-ups, particularly for long-term engagements. If there is a more recent activity than the overdue task, the rep either did not see the task, ignored the task, or did not mark the task as completed in Salesforce. This can be fixed with coaching. If the rep hasn’t logged activity since before the tasks due date this indicates an opportunity management issue. For smaller tasks like a follow-up phone call this may not have a big impact, but for bigger tasks like sending over a proposal, it can have major consequences on open sales pipeline. • Was the task completed? • If no: why not? • If yes: why was it not logged in Salesforce? • By not completing the task, is the opportunity now at risk? Do our reps need additional training on how to use tasks effectively in Salesforce? Do we have too many automated tasks in Salesforce that are making tasks difficult for our reps to effectively use? Close dates are required for an accurate forecast. Mis-managing close dates can be a symptom of larger problems. Depending on how you track performance, reps may have incentives to keep dead opportunities open–such as trying to maintain a specific amount of sales pipeline coverage or win rate. Opportunities moving slower than expected and exceed the close date indicate that the sales rep is too optimistic about the deal closing, also known as “happy ears”. If the opportunity is actually dead but is still sitting in open sales pipeline, it’s falsely inflating your open sales pipeline and impacting the ability for you and the team to have an accurate forecast. It also kills your ability to nurture these opportunities if your marketing automation platforms are set up to ignore contacts involved in open sales pipeline. If yes: why wasn’t the close date updated? What caused this opportunity to move past the expected close date? When do you believe the opportunity will close? And why do you believe that date is accurate? Opportunity size helps identify if a rep is chasing the right opportunities or needs help closing a big deal. It’s okay for reps to push the boundaries of deal size, but if reps have a high ratio of large deals in their sales pipeline, it could mean they are focusing on whales at the expense of catching a lot of fish. If this is the case, it’s likely the rep isn’t working their small deals to the same degree of effort, even if you’re more likely to win them as an organization. Deal size ranges are important to evaluate for the segment the rep is working in. If a large deal is a good fit and well qualified, identifying it early helps bring sales leadership in to support the rep in bringing the deal across the finish line. When deal sizes keep changing it creates a high level of volatility in your forecast. 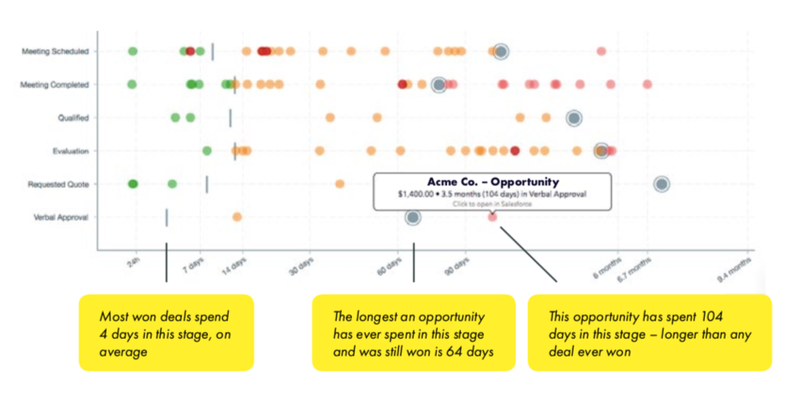 Opportunities moving through the funnel with no deal size artificially decrease the size of your open sales pipeline, forecast, and coverage model. What makes this deal different from our other opportunities? Is it realistic that this deal will close? What support from leadership do you need to keep this opportunity moving? Having the right contacts engaged in the opportunity is core to moving deals forward – logging these in Salesforce ensures you can see who the rep has involved in a deal. Who are you working with in this account? Who else do we need to engage? Why aren’t those contacts in Salesforce? Which contacts do we need inside of an account to win a deal? Do we need those contacts involved at specific stages of the opportunity? Can we automate adding contact roles through workflows in Salesforce or third-party tools? Quarterly business reviews and postmortem deal analysis are critical steps to help each rep (and each team) understand their performance gaps. The following section focuses on how to use closed deal analysis to identify key trends and change bad behaviors in managing your sales funnel. Conversion rates are the primary method of measuring the health of your sales process as a whole, identifying key stages where deals get stuck or lost. Conversion rates are foundational to funnel planning and forecasting – ensuring they are consistent is the primary method for creating a scalable sales process or identifying when new risk is emerging in your funnel. If a high amount of opportunities are staying in a specific stage, why are they getting stuck there? If a high amount of opportunities are getting lost in a specific stage, why there? If a specific stage is a consistent roadblock in the business, what can be done to improve that stage’s performance? If several stages of the funnel have nearly 100% conversion rates (typical for closing stages), do they need to be distinct stages? Opportunities that skip stages of the funnel, or are created in the middle of the funnel. Example: the opportunity wasn’t added to Salesforce until a quote was sent to the prospect. If certain stages are commonly skipped only on certain opportunity types, you may want to consider using Sales Processes in Salesforce to customize stages based on different opportunity types. Was the stage skipped necessary for this opportunity? If yes: why was it skipped? If no: is this stage often skipped? Why? Sales cycle length is an indicator of the stability and predictability in your funnel. It’s a great way to identify forecast accuracy, segment performance, and inform gut feelings in the sales process. There is always an exception – like the one deal that closed in a day, or in 24 months. But these could be the exception, not the rule – knowing the difference keeps your sales pipeline honest. One-off deals happen in every organization – the risk is when one-off situations become expected or ingrained as folklore, such as frequently expecting very old deals to close. Folklore related to one-off deals can be very damaging to sales pipeline assessment and the ability for reps to accept help with coaching and reduces the likelihood of creating a culture of predictable revenue. Opportunities created in Salesforce after they have already been won. The rep worked the deal privately and sandbagged the forecast. When did you start working this opportunity? How were you tracking touchpoints, progress, and activity on this opportunity if not in Salesforce? What circumstances led you to leaving this opportunity out of Salesforce? Opportunities that are created in Salesforce and won on the same day. Did the opportunity really close in one day? How long had you been working this opportunity for? Was there any special circumstances with this account that made you decide to leave it out of Salesforce? Knowing is half the battle. Acting is how you win. To drive consistent sales performance your team needs frequent visibility into red flags, a method to be held accountable, and to change their behavior when they veer off track. This section highlights key ways to manage your team – through 1:1s, probing questions, and actionable notifications. To drive a great team, your performance review should happen daily. Coaching on a regular cadence helps your team develop skills, focus on core objectives, and solve challenges early enough to make a difference. Based on successful teams at scale, we’ve created the following sales coaching model. It’s hard to keep track of every red flag on every opportunity your team is working. FunnelCake sends actionable alerts to reps and coaching moments to sales managers to help you and your team stay on top of your opportunities. Great to share with your team! Keep an eye on your inbox – your guide is on it’s way! Make sure to check your spam folder too!